The term Wildcat Bank refers to a particularly unsound and risky bank chartered under state law in the United States. They flourished after the national bank was decommissioned when a bank was started in a small town. When the banks acquired enough assets their owners would leave town with all deposits. The debt, which hurt many people, eventually became a reason for the Panic of 1857. Wildcat banks were banks that issued money without proper gold in stock to back up the supply. These banks were often short-lived. Unfortunately, since these banks were issuing large amounts of money, many people lost their investment as the worth of their bank note dropped. These banks became a large problem, and were eventually restricted by the US Government. What we have seen in the last 25 years is the return of wildcat banking, brought about largely through a very insalubrious mixture of government intervention and deregulation. Financial institutions have, in effect, used the securitization of debt to create a kind of money, which they’ve used to leverage more debt that is subsequently used to drive up asset and real estate prices and drive up the current account deficit. One of the causes of this wretched state of affairs is the false dichotomy introduced by two ideologies which, although they seem poles apart, have each helped bring about the current mess. I have in mind free market fundamentalism on the one side and anti-market fundamentalism on the other. Both of these ideologies are more interested in their pet ideas than they are in understanding the facts of the matter. The free market fundamentalist won’t acknowledge any exception to his conviction that markets are purely “self-regulating” and that the only role of the state is to protect private property and uphold contracts between freely acting parties. The anti-market fundamentalist suffers from a pathological detestation of market processes and results. The debate about economic problems in too many instances has degenerated into a tug of war between these two unrealistic extremes—that is, into a debate between knee-jerk “deregulation” on the one side and knee-jerk anti-market regulation on the other. But the real issue is not between deregulation and regulation, but between pro-market regulation and anti-market regulation. Markets in an advanced, industrial society require a framework of law in order to flourish. Whether one wants to call these laws “regulations” or not is merely a matter of semantics. But laws are needed to define the extent and limitations of property rights, to determine which kind of contracts should be enforced, and to prevent systematic fraud and irrationality from harming the integrity and efficiency of the market. Now Rand and her apologists clearly belong to the extreme wing of free market fundamentalist camp, where ideology trumps good judgment. Laissez-faire is a slogan, not an insight or a coherent policy. It is a product of rationalism, rather than of experience and wisdom. Greenspan called the banking and housing chaos a "once-in-a-century credit tsunami" that led to a breakdown in how the free market system functions. Accused of contributing to the meltdown, but denying that it was his fault, Greenspan told a House panel the crisis left him -- an unabashed free-market advocate -- in a "state of shocked disbelief." Committee Chairman Henry Waxman, D-Calif., suggested that Greenspan contributed to "irresponsible lending practices" by rejecting appeals that the Fed intervene to regulate a surging subprime mortgage industry. "The list of regulatory mistakes and misjudgments is long," Waxman said of oversight by the Fed and other federal regulators. "My question for you is simple," Waxman told Greenspan. "Were you wrong?" "Well, partially," Greenspan said. But [Greenspan] went on to assign the blame on soaring mortgage foreclosures on overeager investors who did not properly take into account the threats that would be posed once home prices stopped surging upward. He said what had been "a critical pillar to market competition and free markets did break down. And I think that, as I said, shocked me. I still do not fully understand why it happened." After reading this, Objectivists can take consolation in the fact that Greenspan no longer considers himself one of their number—and perhaps never did. Yet his vision of the free market is not so very different from Rand’s. Self-interest, Greenspan believed, would be sufficient to motivate banks to act in such as to protect their shareholders’ equity. Apparantly not so—much to Greenspan’s confusion and dismay! Greenspan would have done well to have heeded Joseph Schumpeter’s insight about the sociological flaws of a free market based on “self-interest.” “[N]o social system can work which is based exclusively upon a network of free contracts between (legally) equal contracting parties and in which everyone is supposed to be guided by nothing except his own (short-run) utilitarian ends,” Schumpeter warned. Here's an interesting quote from Brandon Byrd over at the ortho-Objectivist site Noodlefood. We'll have more to say about Brandon's post "Getting Ayn Rand Wrong" when we have a moment. Suffice to say for now it is a perfect example of what I will dub The Objectivist Double Standard. That is, any criticism of Ayn Rand's philosophy is dismissed as careless and dishonest, and due to mere "personal biases" on the part of the critic, who "attribute all sorts of nonsense to Rand without actually considering what she has to say." Yet when it comes to assessing other philosophers' work it would be hard to find more biased, careless and dishonest critics than Rand and her acolyte Leonard Peikoff who, regrettably, has followed in her footsteps all too closely in this as in all else. Rand's quote-free laziness and low intellectual standards should equally attract the ire of Objectivists - who after all claim to "take ideas seriously". Yet instead these glaring faults are either never mentioned (as in this post) or cheerfully and rather incredibly rationalised as her brilliant ability to "think in essentials". This is the ODS in action. Byrd: I don't know what it is about Ayn Rand that makes many philosophers think they can get away with saying whatever they damn well please about her without having studied her work carefully and honestly. I suspect that the real explanation has less to do with Rand and more to do with personal biases on the part of her critics. But whatever the cause, the phenomenon is nevertheless real. It isn't just that many philosophers dislike Rand. We philosophers are an opinionated bunch; we dislike all sorts of things. Rather it's that many philosophers will attribute all sorts of nonsense to Rand without actually considering what she has to say. Let's see now. Rand condemned Kant "the most evil man in history." Yet despite the slagging he gets throughout her oeuvre, how many times does she actually quote him in all her published works? Incidentally, despite Brook invoking the typical fanatical cliche that "truth is on our side", one notes the appearance yet again of the Ayn Rand Institute's most regularly repeated fake tale: the notorious 1991 Library of Congress/Book of the Month Club survey. The ARI's annual school essay contest about three of Ayn Rand's novels is, allegedly, "designed to promote critical thinking and writing skills". Here are the winners from the last few years. If anyone can detect anything other than standard ARI bromides regurgitated without the smallest glimmer of critical thinking or individual imagination, please let us know. In fact so great is the intellectual and stylistic conformity on display that, with the prospect of a grand or more on the line one can only assume the students involved are shrewd enough to know exactly who they are writing for. Woven throughout the fabric of Salsman’s essay is a rather striking vision of American businessmen. In this “subtext,” one can locate both praiseworthy virtues and condemnable flaws. At a deep emotional level it is, one surmises, that message that Salsman most dearly wished to convey. By his account, businessmen are the heroeswho call upon their initiative and intelligence in order to restructure the resources of Earth, thereby creating the wealth from which we all benefit. They struggle on, often burdened by outrageous laws and regulations, not because they are Christ-figures who choose to suffer for their fellow men, but because they profoundly, egoistically enjoy the act of creation. So far, so good. But Salsman goes further. He insists that these producers cannot be deceived. They “know when it’s worth producing and when it’s only worth shrugging” (2004a, 23). They also buy and sell stock shares, but such shares are never overpriced. They invest millions in capital projects but never at artificially low market interest rates, because they are never fooled by the interest rate shenanigans of the Federal Reserve. In addition, Salsman’s businessmen are innocent of any wrongdoing. They never seek government favors, never lobby for corporate welfare, never try to gain at the expense of their competitors. They never miscalculate. They are without error, either factual or moral. What can one say? These are not real businessmen that he portrays. They are cardboard cutouts. The creation of "cardboard cutouts" seems to be Job Number One at the ARI. Market failure: derivatives As is well known, Ayn Rand opposed any “interference” in the market by the government on moral grounds. Government intervention, for Rand, is immoral. Since Rand believed that the moral course is also the practical course, she held that any so-called “market failures” were ultimately caused by government intervention in the economy. I am of the opinion that derivatives have played a critical role in the ongoing global crisis. Importantly, the proliferation of derivatives has come to radically distort financial markets. As such, I see derivatives as a very close partner to credit excess. Both work to distort market-pricing mechanisms. It is certainly my contention that derivatives affect risk perceptions and change behavior. In this regard, when discussing derivatives I like to use a flood insurance analogy. Say we have a homeowner who would like to build his dream home along the river. Yet, if this homeowner lacks access to affordable flood insurance, the risk of building is likely to be perceived as too great. If, however, inexpensive flood insurance is readily available, the perceived risk of building on the river is acceptable and building begins. Now, taking this analogy one step further, let’s say that there has been a very long drought, which has led to a stampede of companies writing flood insurance. Why not? Premiums in this environment are as close as it gets to "free money." Here, insurance only gets cheaper, encouraging more exuberant homeowners to build dream homes on the river. Despite the appearance of prosperity, risk grows for the entire system. Importantly, the proliferation of cheap insurance fosters a change in behavior – encouraging a building boom along the river and the acceptance of greater risk by individual homeowners and the insurance companies. So come the inevitable flood, there will be more homes destroyed, the solvency of the insurance companies will be in jeopardy, and the risk of failure for the entire system will be much greater than if the building boom had never occurred. Importantly, if a few homeowners purchase insurance and build on the river, flood insurance works fine. If everyone builds on the river and there is a flood, there is a big problem. All the same, a very strong consensus led by Greenspan and Wall Street argues that derivatives reduce risk. I disagree. Derivatives simply shift risk from one party to another. Sure, an individual market participant can use derivatives to transfer risk. But if much of the market moves to transfer risk, there will simply be no one to take the other side of the trade. Entire markets can not hedge themselves. Indeed, for the system, the proliferation of derivatives significantly increases the risk of both market distortions and dislocations. Noland’s analysis pretty much hits the nail on the head, but I think that nail could be driven in even further. Derivatives are often seen as a form of insurance. That’s what the whole notion of a hedge fund is all about. Investors are “hedging” their speculative bets, with the underlying idea that, if their investments turn sour, they’ll still get something out of it. Yet this is plainly irrational behavior. The economist Frank Knight distinguished between risk and uncertainty. Risk, Knight contended, is something calculable. For example, mortality is something that is fairly steady over time. Therefore, there is a calculable risk that an individual will die in a given year, and based on that calculable risk, a company can provide life insurance and still expect to make a profit. Speculative investments do not, on the other hand, involve calculable risks. They are, as Knight would say, uncertain. Hence, it is irrational to try to “insure” investments. For the reasons given by Noland, they can’t be insured. Where is the market failure in all of this? Well, it’s quite simple: derivatives are a market phenomenon. They are the product of freely acting market participants. They prove, once and for all, that the market is no guarantee of rational behavior. Whenever the effects of irrational behavior are (1) not felt immediately and (2) profitable in the short-run, human beings will tend to behave irrationally. The question then is: should the government have intervened to stop or limit this irrational behavior, particularly the large consequences it has had over society at large? If a detailed, factual study were made of all those instances in the history of American industry which have been used by the statists as an indictment of free enterprise and as an argument in favor of a government-controlled economy, it would be found that the actions blamed on businessmen were caused, necessitated, and made possible only by government intervention in business. [I]n the midst of financial crisis and dislocation in the mortgage securities market, mortgage rates dropped dramatically as Fannie & Freddie incited an historic refinancing boom. Fannie & Freddie, with their implied government debt guarantees, were able to borrow easily, largely from the money markets, and ballooned their balance sheets with new mortgages. The holders of the old mortgages ... received desperately needed liquidity as households refinanced and Fannie & Freddie bought these new mortgages as well as other debt securities in the open market. During the final three months of 1998, Fannie, Freddie and the Federal Home Loan Bank System together expanded borrowings by almost $130 billion. Admittedly, this had both the look and feel of a true miracle, but in reality this was one of history’s greatest episodes of credit excess. Some may argue, of course, that Fannie and Freddie are not banks and do not create credit. I disagree and see this [as] a critical analytical misconception. Actually, I see Fannie & Freddie as the greatest instigators of credit excess in history. I even go one step further and believe they also create “money.” Consider: as these institutions borrow aggressively from money market funds ... they exchange their short-term IOUs for existing money stock. This borrowed "money" is then instantly used to purchase financial assets. Importantly, this "money" remains within the financial system where Fannie and Freddie can borrow it again and again, repeatedly replacing it with additional IOUs, thus increasing total money market assets. The money just spins around the system as the amount of debt multiplies. Actually, this mechanism works much like the old bank multiplier effect from econ 101, except for one crucial difference. Since Fannie and Freddie liabilities are not subject to reserve requirements, these institutions can virtually create an "infinite multiplier effect." Here is an obvious example of the pernicious effect of government in the economy. Since no one believes that the government will allow a GSE to go out of business, such corporations are not beholden to market discipline—with cataclysmic results, as we’ve seen in recent months. Another pernicious effect of government is the implementation, through various legal and tax devices, of incentives that work against rational decision making. The government wants more people to own homes. After all, homeowners make better citizens. So the government pressures the GSEs and other lending institutions into lowering lending standards. Of course, this winds up having the deplorable effect of increasing the amount of bad credit flooding the economy. Examples of this sorts mal-incentives could be multiplied endlessly. Like the Fed of the 1920s, the 1990s Fed has repeatedly put "Coins in the Fuse Box" over what I see as a "Persistent Financial Crisis" going back to the 1987 Stock Market crash. I believe this post-crash accommodation helped foster the real estate bubbles in the Northeast and California, the junk bond fiasco, the S&L debacle and other excesses from the late 80s….And it was during the early 1990’s that the Greenspan Fed "let their guard down" and began to lose control of the financial system. First, the Fed’s aggressive move to bailout the bankers created a big moral hazard issue. Second, with short-term rates plummeting, an opportunistic Wall Street went into what I call "harvesting asset mode," inciting a major shift of funds from bank deposits to mutual funds, money market funds, and securities, thus sowing the seeds for today’s financial bubble. Third, by pushing Fed Funds to 3% and creating an unusually steep yield curve, the Fed incited unprecedented credit market speculation, thus playing a major role in the proliferation of both leveraged speculation and its close sibling, derivatives. After all, 3% Fed funds were a godsend for the hedge funds, Wall Street proprietary traders, and derivative players. Fourth, ultra-easy money fostered leveraged speculation in high-yield emerging debt markets. And fifth, a very important but unappreciated factor, was the emergence of Wall Street inspired non-bank financial companies and the incredible growth of the asset-backed securities market. As an aside, it was in 1991, during the darkest days for the banks, that Fannie Mae and Freddie Mac began to aggressively expand their balance sheets. Yet, Greenspan acquiesced, apparently more focused on the "Strong Headwinds" of an impaired US banking system that he saw as restricting the US economic recovery. He was loose and Wall Street took full advantage. The explosion of non-bank financial credit had begun and the Fed was quickly losing control. My original intention was to start a series of posts on Objectivism and politics. But the seriousness of the crisis in the credit and finance markets suggests that our focus should turn to economics. What is happening to finance capitalism is extremely serious—more serious even then what happened in October 1929. While much of what has happened in the last 20 years can easily be laid at the hands of government interference, it is not clear that everything that has happened is the government’s fault. No specific ideology comes out of this mess looking like it has all the answers. But the mounting financial problems reveal that Paulson and Bernanke are as clueless as any other central planners who try to control an entire economy. They are not saving us from anything; they are delaying some of the pain that necessarily follows from a Fed-induced credit bubble, and redistributing that pain to innocent victims. They are punishing responsible individuals and rewarding irresponsible individuals. For better or worse, Brook’s "do-nothing" approach to the problem is not a viable option. Any politician who stood for it would be immediately discredited in the eyes of the electorate. The political reality is that market solutions are not allowed in crisis situations like the one we are facing. Hence we find former Objectivist Alan Greenspan (who understands the underlying political climate better than any of the ARI folks) suggesting another approach. "We need laws that specify and limit the conditions for bailouts -- laws that authorize the Treasury to use taxpayer money to counter systemic financial breakdowns transparently and directly rather than circuitously through the central bank as was done during the blowup of Bear Stearns," Greenspan has written in the paperback version of his autobiography, The Age of Turbulence. In other words, Greenspan is arguing that, since the government is going to intervene anyway (no preventing that), at least it should intervene in as rational a way as possible. Can the government intervene without making things worse? Well, given how dire the situation really is, it may not really matter. If market forces were allowed to do their thing, the consequences would be little short of catastrophic. There is at least $2 trillion dollars in bad debt out there (and this is not even including bad derivative-related debt, which may be in the tens of trillions). If you allow company A to go under, then it can’t pay it’s obligations to company B. But then company B can’t pay company C, which in turn can’t pay company D, etc. etc. In other words, if the market it allowed to do its thing we would almost certainly see a collapse of a good portion of the financial system. Even more serious, such a collapse could trigger a very serious deflation, as the credit bubble bursts and suddenly you have massive contraction in the money supply (some of this deflation has already occurred, but it has been confined to the housing and asset markets). Deflation is one of the worse things that can happen to an economy in peacetime. If the United States went through a major deflation, that would greatly strengthen the anti-capitalist left in this country, which would put the nation in serious peril (and put an end to any hope for a market solution). As we are witnessing today, the issue is not some manageable amount of new “capital” to replenish banking system losses. Instead, the predicament is the massive and unmanageable amount of new Credit necessary to, on the one hand, sustain a mal-adjusted Bubble Economy and, on the other, the Trillions more required to accommodate a gigantic speculative de-leveraging. I have a very difficult time seeing a way out of this terrible mess. From another point of view, however, [the power of philosophy to change the world] is not ominous—it can even be regarded as encouraging. For it means that if a good philosopher arises who answers and philosophically destroys [a pernicious philosopher like Kant], that will turn the reign of the evil and save the world. And such a philosopher has arisen in our time—in my judgment, at least, and I am sure in most of yours. I am speaking, of course, of Ayn Rand. On the basis of the theory of history I have put forth today, therefore, it is proper to have hope for the future. I do think that Objectivism will triumph ultimately and shape the world’s course, and that today’s culture will be remember in the end only for what it is—which I refrain from saying. This optimistic prognosis was made over four decades ago, and still Objectivism has made little if any progress towards its “ultimate” triumph. 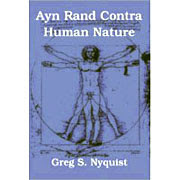 Indeed, if by Objectivism we mean the purest, orthodox brand of that philosophy, we would have to admit that it has regressed since 1962, thanks to two major schisms in the movement, one involving Rand and her leading disciple Nathaniel Branden, the other involving Rand’s intellectual heir Leonard Peikoff and the movements most promising and effective advocate, David Kelley. Since Rand’s 1962 prognosis has turned out to be so palpably wrong, how much faith should we place in Peikoff’s suggestion of an “ultimate” triumph? Given the intellectual foundation that these Objectivist hopes are based on, no faith should be placed in them. The Objectivist hope for an “ultimate” triumph is on the same level as the Marxist’s hope of for the eventual triumph of the communist paradise or the Christian’s hope for the rapture. It is an extra-empirical hope, without basis in fact, science or even good sense. It completely ignores what actually motivates human beings, substituting instead an entirely baseless schema of motivations based on abstruse metaphysical and epistemological notions that hardly anyone understands or cares for. Worst of all, it is a species of conceit so gross and intense that it boggles the mind: for it suggests that Rand and her disciples, simply by wagging their tongues and jiggling their pens, can “turn the reign of evil and save the world.” Under this notion of history, ideas become a kind of talisman or power. “In the beginning was the Word,” begins the Platonist gospel of John. Rand’s philosophy of history is merely a kind of secularist riff on this mystical theme. Should this mystical, Platonist detour surprise us? Not at all. For that is the tradition of philsophy that Rand harkens from: the Platonic-Aristotelean tradition of metaphysics and wishful thinking, rather than the tradition of the Greek Naturalists, modern science and the critical empiricism of Hume and Popper.